Packaging should be easy on the eye so to say, it should be good-looking. For example, you could choose to use bright colours to make the package stand out, but this might also evoke strong reactions if it is too ‘provocative’ so to say. Bright pink is one example that is not applicable on any package. Another mistake could also be to “overdesign” the packaging and add too much info, design features etc. Apple is always used as an example of great packaging, mainly because of its clean look. One of the biggest frustrations is when a package doesn’t open in a proper way. We all know this from vacuum packed coffee packages or the cellophane around a CD box. About the last, somebody recently told me an amusing anecdote. He told me that somebody had organised a competition where people had to unwrap as many CD boxes as possible in a given time. We can all guess the result, but let me tell you, the results were even worse than you would have imagined. MOST of the people were only able to open a few in let’s say 5 minutes. Superhuman strength required. The strength required to separate the two parts of the clamshell or to peel the backing from a blister can exceed human hand strength. The problem worsens with age, as strength declines and using scissors or other tools becomes more difficult. Lack of visual direction. Visual cues that show how and where to enter the package are woefully lacking. Package designers should know the structureÃ¢Â€Â™s weakest point and, as a result, they may know how to open the package with relative easeÃ¢Â€Â”but they donÃ¢Â€Â™t share the information. Non-intuitive. The actions required of your hands and fingers to open a package should be intuitive. After looking briefly at a package, it should be explicitly obvious how to get into it. CanÃ¢Â€Â™t get a grip. Clamshells designed to be opened by grabbing one half of the shell and pulling it away from the other half typically lack grips that are large enough for you to get a good hold. Hard on the eyes. Particularly for the 40-plus crowd, glare and lack of contrast make it difficult to see through the blister, read package copy and/or see the edges of the package. Some designs compound the problem by incorporating difficult-to-read typefaces and small type sizes even for informative copy, such as directions for opening the package. Causes injuries. Applying scissors, knives, corkscrews and/or box cutters to the package leaves the plastic sharp enough to cut through skin, if the tools themselves havenÃ¢Â€Â™t already. Puts product at risk. After twisting, cutting and jabbing at the package, you finally tear it open. But you do so with such force that the product flies across the room. By that time it may already be scratched from the implements used to liberate it. Difficult to dispose. Particularly for large productsÃ¢Â€Â”envision a handheld vacuumÃ¢Â€Â”the blisterÃ¢Â€Â™s size and resistance to crushing make it a pain to throw away. And, if the plastic is non-recyclable, itÃ¢Â€Â™s a pain for everyone on the planet. By all means does a package need to remind the buyer of the brand they bought the product of, but this level can also be used to evoke certain emotions that are related to other brands. Reflection: Packaging of strong brands is copied to evoke similar emotional reactions. One of the most obvious examples could be the Coca Cola packaging style. Coca Cola, the strongest cola brand and one of the strongest brands overall, uses the distinctive red color combined with white letters in all of their packaging and communication. Other cheaper cola brands have copied these very recognizable features to evoke the same emotional reactions as with the real Coca Cola. 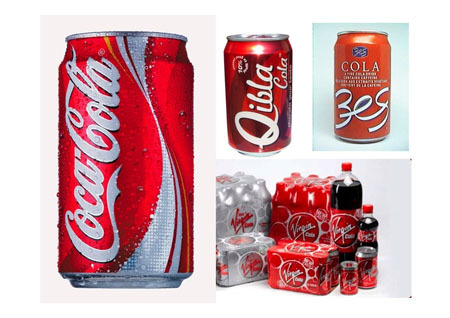 After decades of branding the red color and white letters have become the main features to recognize cola. Where it is logical that orange became the color for Sisi or Fanta (oranges are of course orange), it was the quality and popularity of the Coca Cola brand itself that set the standard for other cola brands to choose red (obviously, Pepsi is not one of them). This way cheaper brands can also try to adopt all of the positive associations consumers have with the Coca Cola brand, only by using the same design features. Above: 3es, Virgin and Qibla cola are copying the familiar design features of Coca Cola. Luxurious packaging can be used to give people the impression that they are buying a highly exclusive product. These type of packages are worth to be seen with and even to be saved at home, almost as a purchase souvenir. At the office, we also placed a box of an Apple product in our closet, just to show we own an Apple product. You might be able to think of more of these examples. On the other hand, hiddious packaging or cheap looking packaging can be a mistake, but this is not always the case. Cheaper products on the lowest shelf in the supermarket usually have a very distinctive, cheap look. But this adds to the image and expectations we have with this type of products. It should look cheap. One other interesting topic is the difference between physical and virtual packaging. Physical packaging vs. Virtual packaging – What if we can’t experience the package with all of our senses? At brandchannel.com, Randal Frost wrote a very interesting article called “virtual packaging lacks sense“. Here he talks about the fact that we have always assumed that impulsive and emotion based purchasing was mostly done in normal “physical” stores. In normal stores, consumers come face to face with the sensory qualities and emotional triggers of the physical package and with the multi-dimensionality of the shopping environment. It was also assumed that with online purchasing behaviour our rational nature would have the upper hand over emotion, mainly because browsing on the internet takes time, you have more opportunity to compare products and you don’t have the same tactile experience as when you hold a product and package. Nevertheless, recent research showed that people who buy online are more likely to buy products impulsively than those who buy in a normal store. They are less averse to risk (more trusting), and are less brand and price conscious. Dr. Colin Huang of Sheffield Hallam University in Great Britain thinks it is possible to design virtual packages that, like physical ones, make both rational and irrational appeals. Huang argues that online packaging can achieve the same qualities as physical packaging if there is a direct route for conveying product information and an indirect route that appeals to the viewerÃ¢Â€Â™s emotions. He has, for example, found that people respond to interactive play in much the same way that they pick up things and handle them in a bricks-and-mortar store. Interactivity would seem at face value to be a powerful alternative to tactile encounters. Personally, what I do usually is first go to a physical store and experience a product and package “live” and then get behind my pc and compare online stores, reviews and prices. Many (if not most) people do this and obviously a strong synergy has arisen between physical and online shopping. What this proves I think, is that it is very important for online stores to pay attention to the product and packaging experience of online shoppers. I also think that the online packaging experience is more important than most online stores realise. Of course, some packaging and product experiences are less important to have experienced before a purchase, like with books (see the success of Amazon). I have taught design theory at Duke University (USA) in the Pratt School of Engineering for over thirty years. My focus has been on failure analysis and product safety, and I was attracted to your Opinion piece on Packaging Design and Emotion. I am now working on a case where a customer was injured when a loose tool bit flew out of a clamshell package as he was trying to pull it apart, after cutting three sides, and injured his eye. Are you aware of other instances where a person was injured by loose products propelled from clamshell packages being opened? Thanks for your nice example. I can imagine the frustration that this customer must have experienced after cutting three sides and it was still not opening. He must have tried to pull it apart in a thoughtless act, heavily influenced by emotions. Great example of what can happen when you drive people to go mad with your packaging. This shows that not only aesthetic qualities matter in packaging design, but usability does just as much (or even more!). I don’t think I am aware of other examples that are similar to this. But I would encourage people who read this to come up with their examples of packaging terror. See the Klever Kutter @ http://www.safecutters.com. 2. packaging needs to be user friendly – taken out of the hands of the engineers and made more intuitive by designers who think from the user’s perspective. 3. packaging has to contribute something – given it’s massive impact on the planet and its resources, the packaging industry, and consumers, need measurable incentives that reward supporting both environmental and usability concerns.